Choices are good. Especially when the products you have to choose from differ in quality. This is happening in the fertilizer world today. 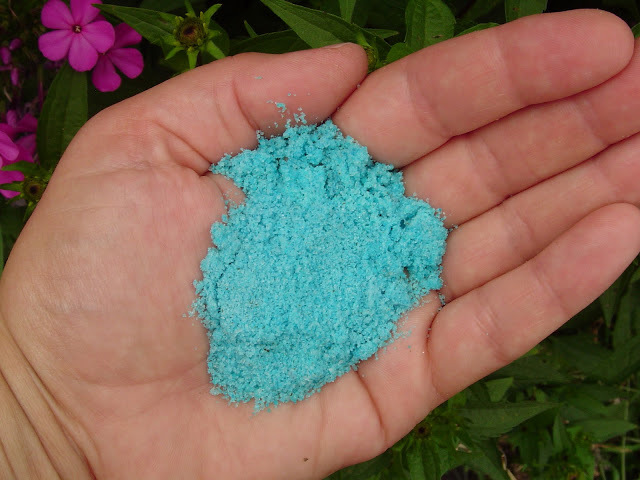 It used to be that you could buy synthetic “blue”, mix with water fertilizer or a generic version of this and not much else was available. You saw ads for Turf Builder and then there were the hardware brands or the white bags of 18-10-10 for your lawn. Today there are many new brands on the shelves and they contain the newest product developments in soil science. Today’s choices are amazing and leaving customers overwhelmed. I want to help by explaining when a good quality organic fertilizer might be a better choice over a synthetic. There are times when synthetic is absolutely fine, and other times when it would be detrimental. It really depends on the plant, and if it is one that you want to keep around or not. When I was raising my children, we had a choice as to what to buy for them to drink. I was one of the “100% juice” supporters who looked down on Kool-Aid and 10% juice products. I loved my kids and I wanted them to grow up healthy. I read labels and stood my ground. Giving your plants that you value a synthetic fertilizer is like giving your kids Kool-Aid when you could give them fresh squeezed! Sure, it will give them enough to survive on, but it will not help them to thrive! Synthetic fertilizers are cheap and full of fillers, mainly salts. It is the reason that the clay pots will get a white crust on them after a season of watering and fertilizing. Synthetic fertilizers are made of strong chemicals that kill the life in the soil. Millions of microorganisms live in healthy, life filled soil. These beneficial microorganisms that are in the soil help keep the plants healthy and disease resistant. Organic fertilizers are now being made with beneficial microbes and fungi added into them! When you give these to your plants, you are feeding your plants and your soil. Your plants you care about will be given the best quality nutrition available. There is a time and a place for Synthetics, though. If you have annual flowers that are here this season and gone the next, go ahead and feed them anything. Hanging Baskets are heavy feeders and do well with synthetic. My rule of thumb is this, if you love the plant and want it to be a permanent addition to your yard, or if you are going to eat it, use quality organic food with microbes to give it all it needs to be its best. Fall Lawn Feeding Season is fast approaching and there are many choices to be made here, too. Remember, you wouldn’t give your kids a can of SODA POP and send them to bed… Give your lawn high quality, organic lawn food with microbes, and tuck it into bed with love!